The official unveiling of this much-loved and now beautifully refurbished Bandstand was marked by grand speeches and some fantastic music from community jazz band Brass, Aye and local schools Hillhead High and Sgoil Ghaidlig Ghlaschu. It was a great moment for all those involved in the £2.1million project – read more about the history, background and details here and here. Amid the speeches, there was a mention for the Friends of Kelvingrove Park in the ‘thank-yous’ list from Glasgow Buildings Preservation Trust (GBPT) chair Pat Chalmers. But when it came to handing out souvenir pictures to all of the project partners’ proud – and rightly so – representatives, a question rang out from the back of the amphitheatre: ‘Where’s the picture for Friends of Kelvingrove Park’? From the stage, there was an off-script reply that GBPT would get a picture sorted out for the organisation ‘later’. But to many local onlookers, in this high-profile and highly successful city project, it seemed the efforts of the Friends of Kelvingrove Park had perhaps not been given the recognition they deserved. This group began to raise concerns about the Bandstand throughout the 1990s, a driving force that became a fully-fledged campaign to restore the building and retain it as a valuable community asset of great historical value. In 2002 the Friends of Kelvingrove Park carried out the feasibility study into a possible restoration project – and one year later Glasgow City Council had approved the plan in principal. Yet it took another seven years of hard lobbying by the Friends of Kelvingrove Park – backed by a strong grassroots support – to secure the city council’s commitment and initial funding to at last progress the restoration. As plans for this year’s Commonwealth Games gathered force, so too did the prospect of securing the Bandstand as part of its legacy. By 2010, the project was rolling – and today’s ceremony marked the culmination of a classy restoration job by Glasgow City Council, GBPT and Glasgow Life. However, what this community knows for sure is that without the tireless efforts of Friends of Kelvingrove Park, the B-listed Bandstand and Amphitheatre would not be a unique and shining outdoor venue – but still lie decaying, a derelict shell. Pink Elephants in the Botanic’s. In practice it could go like this. When the developer is met by a difficult site, a community grassed area for instance, that is to say they want to build 150 flats (when they are only really after 30 or so). The people protest, the developer bends over backwards reducing the number of demanded flats each month (or year) until the campaigners have fallen off, or are exhausted, by this time the developer begins to look reasonable in his or her pursuit to please everyone, especially with the help of the newspapers (who will eventually help to advertise the flats or property) Result for community – More green space disappears. 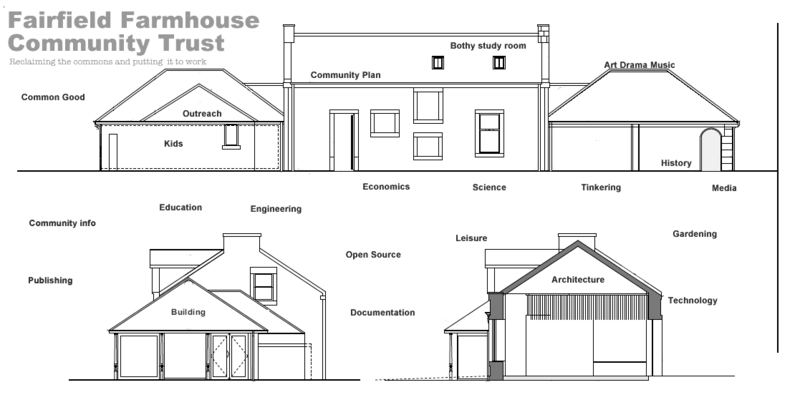 Campaigners – gain knowledge of building regulations and aesthetics. Developer – 30 flats built – Mission accomplished. It becomes easier for the pure profit industry when no one is fighting the core issue, which incidentally is the same across Britain. Land! Control the land and you control everything else. We should not be giving credence to the council by even discussing the details of there plans regarding commercialising parks. Listening to the organ grinders monkey, [Robert Booth] discussing non existent fantasy plans, dreamed up by a developer – will get us nowhere. Mr Booth is only there to absorb the flack while the real business goes on in the background. We need to remember the issue is “business control of our parks” – not the detail of what the council at the behest of business are deciding – is or isn’t going to be built on them. The privatisation of our parks, has been on the cards for a couple of years – since the sham consultation that will put all of our parks in the same situation. The problem is, as in the case of the recent campaigns, folk tend to deal with the problem, only when the dilemma arrives at there own door, Sometimes that’s to late. “Yes it is NIMBYism” I hear at a protest meeting, which means don’t put it in my back yard, put it in somebody else’s. This is a bad tactic to use for Glasgow parks. Might work if it was a nuclear power station when only a few are doted round the country, But, if what “you” don’t want in your park ends up in the park up the road, (or any other park in the city) it will eventually come back to haunt you in some form. If you fight for one park you might as well fight for them all. They are all of our parks for all of the people, rich or poor. and a harm to one is a harm to all. If we do not know this yet, the King’s and colonisers of this city will be very happy – NIMBYism suits the council. The consultation doc says – >”2. Community involvement is one of the keys to success in the regeneration of our parks.” < “Community involvement” in council-speak, means, as the following passage will illustrate – dividing up parks to make local residents easier to manipulate and control. Someone at the Save our Botanic’s meeting, when listening to a comparison with Kelvingrove park, said “What has Kelvingrove go to do with the Botanic’s?” The answer is everything. Take a walk round Kelvingrove. (Glasgow’s most popular park, right next to the Art galleries – well used and full of tourists.) You will find in Kelvingrove park disused and abandoned building in the form of toilets, a derelict bandstand, kids swings that have disappeared, kiddies swings that are rotting and falling apart, paths full of holes, broken fencing, and so on. Why you wonder is one of Glasgow’s most well used and popular parks going to blite? You might well wonder why the same park has a dedicated and caring friends group who have not only protected the park from the onslaught of developers for years, protected the wild life, kept the public well informed about what is happening in their park, and have toiled for years (14) to put the park bandstand back into public use. The battle for the bandstand in Kelvingrove, is part of the same battle that every other park in glasgow will eventually be fighting. The reinstatement of Kelvingrove bandstand would send a clear message to the public as well as the council of what we “do” want in our parks – as well as what we don’t want. The Kings and the councils have endless budgets (a lot of it ours) for spreading propaganda in order to brow beat and cajole the public into believing what they do is wonderful. In comparison, all most campaigns have is there wit, imagination, a photocopier and a few quid if their lucky. We can not fight these people using their tools. We will not win engaging in their terms. The issue in the Botanic’s, Pollok park, as elsewhere is a Common Good issue (in the fullest sense) not architecture and facilities – and should be dealt with the same way that Springfield Park, (Scotstoun) dealt with another wonderful scheme the council came up with – to build 600 odd car parking spaces on the parks football pitches. “No cars in our park period”, was the message the council carried off ringing in their ears. Our city is being brutalised by public funded administrators whose vision for Glasgow is based on oil and the car, which is a primitive dying technology. While even in American cities, freeways building is in decline, and some are being converted into greenspace – meanwhile our city chiefs are still engaged in carrying out ancient plans (which even they know are moribund) to construct 8 lane motorways. Who will gain? Banks. Think about it council people – If we end up looking like Manchester – tourists will go to Manchester. We have beautiful, unique, autonomous, uncluttered, uncommercialised, therapeutic open green space called Glasgow Parks. People will come to our city for that, and do. And in a few years time when we can’t move in our grid locked cars. When we can’t just pop into the 4×4 and dash to the country. That’s when we, and our children, will appreciate the effort we took in caring for our open space. It’s the only place we will have in the city to stay sane. What the city needs now is not NIMBYism but a Glasgow wide campaign to stop the theft of our Common Good. All of our common good. All of our parks. I don’t think we will do this, just because we know the law, or can read an architects drawing, or have time to sit up the University library researching text books. These are very useful tools, but they do not motivate the majority of folk into action and that’s what we need if we want to stop the colonisers taking over our city. The whole is much greater than the sum of it’s parts. The parks issue which I think is one of the most important public concerns to arise in years and is part of a much wider strategy to monopolise public life into private finance. In a positive note, I think it could be an opportunity for a show of public solidarity just when all of our communities might need it most, when all parts of the city are being ravished and folks needs are being put to the subservience of banks. To use the words of Glasgow City Council PR machine. “An opportunity has been recognised” – and we would be daft to ignore it. All of our Parks – for all of our people – Unite the fight for the common good. See what you want to see, not what your told you’ll see. The scottish office is open for business. In case people are unaware the authorities are proposing to build a school in Kelvingrove Park. The experts see the idea as a wonderful opportunity, most parents and locals involved see the idea as stupid. I find it difficult to waste time on their reasoning for this school anymore. The basic difference is. One side want there kids to go to a safe, secure, local educational, environment and the other can only think of how to make money from anything, (that’s public) they can get there hands on. Here are my notes from the school meeting – I think they held a separate one for parents only – WHY? – to split the opposition? Pointing to a map of the depot & the rest of the park, Henry McKeown (spokesperson for the architects) said ” The green bit is the extended park adjacent to the site”……..
“There is a perception that the site is intruding into the park, because it’s called ‘the school in the park’. It is in fact a hole in the ground and a tarmac park depot” – (doesn’t have quite the same romantic ring….. ) -“we reckon putting a little school in it will enhance rather than detract”. There was ‘spirited discussion’ about idealistic v realistic assumptions about how many kids WILL walk or cycle to & from school and how much extra traffic will be generated. It was pointed out that there is no public transport of any kind available to the kids from Kelvinhaugh.The resulting silence & exchange of glances suggested that this might have been news to them. Also pedestrian and “drop off point ” at Kelvin Way. “We intend to use existing historic features upgraded/recycled”. There will be a playground on the Gibson St side and 4 other play spaces. At Otago St. there will be a ramp up to the entrance and an art installation on the side of the ramp. There will be no corridors except an “umbilical”?! to “negotiate the existing house” but they may in time purchase the house for more play space. The classrooms will all be “one-sided around a social space”. There will be a car park for 23? spaces (access from Westbank Quad.) concealed under the playground. There will be a big collecting point/play area off Kelvin Way. Dr Colin Begg of 5 University Ave. expressed concerns about noise, litter, traffic & parking and the proximity of the 2storey building to the back court of his flat. Q: Don’t children do better at smaller schools? A: Is 90 or 98 viable in an urban setting? Parking will “categorically” remain as it is at present on Otago St. There will be no parent parking provided. There will be zigzag lines outside that entrance. The 3 existing crossings on Gibson St should be adequate. They intend to restrict parking at certain times on Kelvin Way to enable parents to drop off kids. It was pointed out that University people park there from early morning. “They will just have to park elsewhere, in the mornings and move their cars later”. Q: Why has that not been done before reaching this stage? Q: Where will the depot be located? Q: What about grass-cutting machines & other vehicles necessary for day to day maintenance of Kelvingrove? A: There will be a small depot area at the tip of the site (at existing internal park gate. Some vehicles will be brought from other areas of the city. Q: Doesn’t that defeat the stated objective of cutting down fuel consumption, by discouraging people from using cars? A: Some vehicles go out just now, but some will come in in future – so there will be a balance…..
Q: Is there any chance of overturning this, or is it a rubber stamp? A: ( Visible surprise at the question) The Council has asked that a school be put on that site. Parent: Hillhead is 300 pupils at the moment. 21 classes at 30 each. “Extending the site” was mentioned as a possibility at a later date…. Q: What do you mean ‘extend’ the site? Do you mean extend further into the park? School is expected to last for 60 – 70 years at least. Questions & discussion about why consideration was not given to repairing say 2 of the old schools, instead of building a new one. A: Looked at a site near Dowanhill school, but it was a childrens’ play area, so we’d have been removing an existing amenity(Dowanhill Park!). Also the ‘Park & Ride’ at Kelvinbridge, but it’s still owned by the railway and it sometimes floods, and has a rat problem. We couldn’t find anywhere else (lamely). Q: Would you have had to buy other sites and this one’s free? A: With respect – YOU would have to buy it because Council Tax would be put up to pay for it. “The football pitch will certainly have a fence round it. Q: The depot is within the boundary of the park. Therefore if the depot is taken away, shouldn’t the area become landscaped parkland? A (from MacDonald): Is the depot open at night just now for a dauner through? “Comments will be put into part of the report which goes to planning committee to be looked at. Windows & materials not finalised yet. Point made that mail sent to ‘Owner/Occupier’ often goes straight into the bin. Q: Was there a stringent/aggressive attempt to source and notify all the ‘neighbours’? A: McNab read out the whole list of people & groups informed. Submission goes in 25th June. A: She’s actually quite happy about it. Q: Is she giving you one story and me another? Q: You mentioned the white house earlier. What’s the position about that? A: I met the “rather charming lady who lives in the white house. She is concerned at having 500 kids and a school built around her and will go away and think about it. “The land is owned by the Council, so the Council is the developer. The Backpark is not a highly visible piece of land – it is at the back of the railway line, back of the houses, back of garage, back of old cinema at Cathcart Road near Holmiea Road. This area was listed as recreational space but in August 2003 Glasgow City Council changed this to surplus to requirements and zoned it for housing. No local residents or organisations were consulted on this. There are currently plans before the Council from ASHomes to build 90 flats with parking spaces on this piece of land. This will mean not only the loss of recreational space but at least 90 (eventually 130) cars daily will add to the air pollution, noise pollution and congestion of an already known accident black spot. There is already excessive on street parking of cars of workers at Scottish Power and Weir’s Pumps although the area is served by good public transport. Taking into account three other developments all within half-a-mile will mean 250 extra cars in a year’s time in this area. This is all over and above the developments recently in place in Kingspark, Newlands, Old Castle Road, Shaw lands etc. This development will reach 7 storeys and 6 storeys in height. The flat roof design does nothing to ameliorate how out of place this development v> ill look, and not in the least in character with Cathcart. The local primary school is on the main road and the only remaining green space is on the main road and round which the buses travel. Glasgow City Centre has one of the worst air pollution problems in Europe. We must stop it moving to the suburbs. There is no Community Centre in Cathcart; the nearest sports centres are Toryglen, Castlcmilk or Pollokshiclds; the nearest swimming pools are Gorbals and Castlemilk (since Calder Street is now closed down). It’s time the Council gave something back. There are alternative suggestions which would be of greater asset to the community. The allotment holders have previously expressed an interest in expanding their area. There is interest in renovating the football pitch. A cycle path, a skateboard park – a sensory garden with good disabled access would be very welcome. 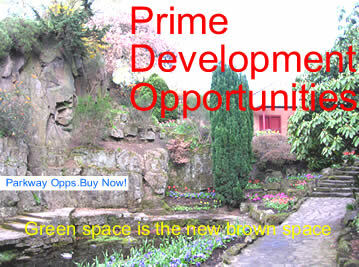 Please help us tight to save the loss of another green breathing space. Why is the parks public consultation document not on the side of a bus? We appear to be surrounded by experts, who deliver the message to the people, the way it is, up to date, on the spot, in your face, where and when it maters. However his piercing”getting to the heart of the mater”, applied by Glasgow City Council, to profit and business interests, seems to wan somewhat, when important issues of public interest is concerned. How come, with this publicity relations machine, that serves the above mentioned well and cost the tax payer plenty, seems to render itself redundant, when the tax payer needs it most. Why when it comes to important issues such as; the future of our parks and green space, the council manage to bury the relevant documents so deep, that even when found; offer no reference, comment, views, debate that would help or encourage the public to form an considered opinion. Why are the Glasgow public tripping over giant banners and posters concerning the “Glasgow Style” campaign, which is irrelevant, meaningless, embarrassing and costly to the average citizen. 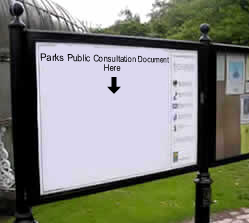 How much would it cost, compared to the above, to place a notice board in every park in glasgow outlining the councils proposals, ideas, and questions, concerning public green space? I visited Glasgow’s peoples palace recently to find a massive area of the Glasgow Green, cordoned off by sheet metal hoarding’s. When I enquired I was informed a concert was to be held there the following Saturday. Given this was Saturday the work had been going on for a day or two and would go on after the event a day or two, cleaning up, grass damaged and so on. This means a large area of park will be taken up by a business event for two weeks. £79 for a two day ticket – with more events planned. Not far up the road past the Peoples Palace, in the same park, next to the swing park (which is free) there is a fenced off fairground, which cost a £1 entrance plus the extortionate price of the rides. Why is a business interest allowed to pitch an expensive fairground event on public property, charge an entrance fee to an area of public park, right next to a free public swing park? Ask any parent of smaller children, especially those on low income, what they think of this one. 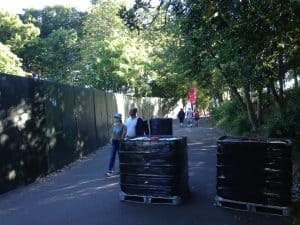 The “West End Festival” and other amateur events have been commandeered by the carnival of business which is a precursor in privatising our parks. What used to be community events ar practically devoid of community apart from in name, and are being homoginised by the noise of fairground and hot dogs. You know longer go to an charity event in the park, to hold a bird of prey on your arm and get your picture taken for a £1 to impress your friends, or buy some home made cake (not that long ago I might add) You go to the charity event in the park to be drowned by noise, screaming weans, radio show broadcasts, expensive trash, and overpowered PA systems. At present a skateboard park is being constructed in Kelvingrove park. Seemingly, according to the Glasgow “Evening Times” the skateboard park is being constructed after 20 years lobbying? By whom one wonders? There was another skateboard park in Kelvingrove park in the 70s, about a hundred yards away from where the new one is situated, (now filled in as flowerbeds). The reasons given for the closure of the old skatepark, were safety concerns think the closure was more to do with the residents being pissed-off by all the kids invading the area, rather than the safety issues. Boarders were coming in from miles around to use the facility. And let’s face it, on the safety issue, the council are a lot more safety conscious (paranoid) now, than they were then. Or could it be to do with pushing the Trojan horse of commerce through the doors of our parks in the innocuous pursuit of “doing things for children” ie replacing autonomous creative space to specialised interests space as part of a strategy to privatising public parks? I hope not, but I would be foolish not to read the signs that are common to privatisation tactics. The above is not meant to poo poo everything that goes on in public parks, but to encourage what does go on – remains in the publics (shared) interest. For this to happen we need to engage in the debate. The park performs an important social function in the life of the city dweller. The fact that the park hasn’t changed much in its basic structure, amenities, and uses over the last hundred years, bears witness to its success. The reason for this is simple.The park is where you go to escape the rat race. The obliteration of every bit of green space in town is near completion, or will be under threat, sooner or later. Already inroads have been made to accommodate the same development strategy in our parks. That is to replace the tranquil nature of the park with the noise of business; to obliterate amateur, community, events, with commercial attractions and hamburgers- that will pave the way for -Park Commerce Facilitation Ltd or some such scheme. Our parks could join the fate of the places listed below. We can not afford to wait until it is to late. We need to protect the autonomy of our park’s so that future generations can share in the respite from the grind of city life, that we enjoy and what the park offers. The park works to serve this function because of its uncluttered simplicity. Unless we engage in the debate to preserve the park for people now!, we will soon be unheard above the noise of those with other ideas. * This list does not include all those listed by the National Playing Fields Association! GLASGOW’S reputation as the “dear green place” is to be reinforced with a multi-million pound plan to breathe new life into its parks and open spaces. The council is expected to approve a masterplan for the city’s 74 parks which will allow private companies to provide a range of facilities. Golf driving ranges, garden centres, cafes and restaurants will all be considered for inclusion in city parks and open spaces. The review followed an extensive public consultation. More than 3,000 children responded with their views on the parks and open spaces and 670 members of the public and organisations contributed. Key issues of concern included safety and security, dog fouling, insufficient toilets and the lack of a visual presence of park attendants and rangers. This year, the council will spend 41 million on maintaining the city’s parks and other outdoor areas such as golf courses and allotments. However, Robert Booth, the director of land services, said that figure should increase by 9 million next year, with 3 million of the total coming from the Heritage Lottery Fund. He added: “We’re asking the council for a substantial investment in the parks. Glasgow’s parks currently attract up to 20 million visitors a year. The collection is divided into five city parks, such as Pollok and Kelvingrove parks, 12 district and 57 local parks. However, Mr Booth said he was keen to see the management of the parks overhauled, so that decisions on their future are taken at a local level, with managers empowered to implement change. Local communities will also be encouraged to put forward their own plans. Mr Booth admitted that during the review, the possibility of the parks being run by an external organisation was considered. However, the option was dismissed amid fears that private contractors may charge for some of the facilities which are currently free. Aileen Colleran, the convener of the parks and facilities committee, gave an assurance that none of the city’s parks and open spaces would be sold off to private companies such as housing developers. She added: “We’re kicking off the debate about our parks and what we want to use our public spaces for. The council hopes to encourage greater use of the parks as part of its agenda to tackle the city’s poor health record. Already, the city’s parks have been undergoing a multi-million pound makeover, with the Kibble Palace being restored and glass houses in Tollcross Park resurrected. Skateboarders have been flocking to a new 350,000 facility at Kelvingrove Park which opened at the weekend and a mountain bike trail which opened earlier this month at Pollok Park. If accepted, the new strategy will be implemented from March next year.